The Zowie FK is a classic gamer mouse used by many pros and with good reason, mainly because it’s a ridiculously comfortable mouse. Aiming with this mouse should feel like a dream for most gaming hands and grips. The sensor in this mouse is behind for 2018 standards but it’s still a great performer, it’s a mouse I find I go back to using in spite of its sensor. 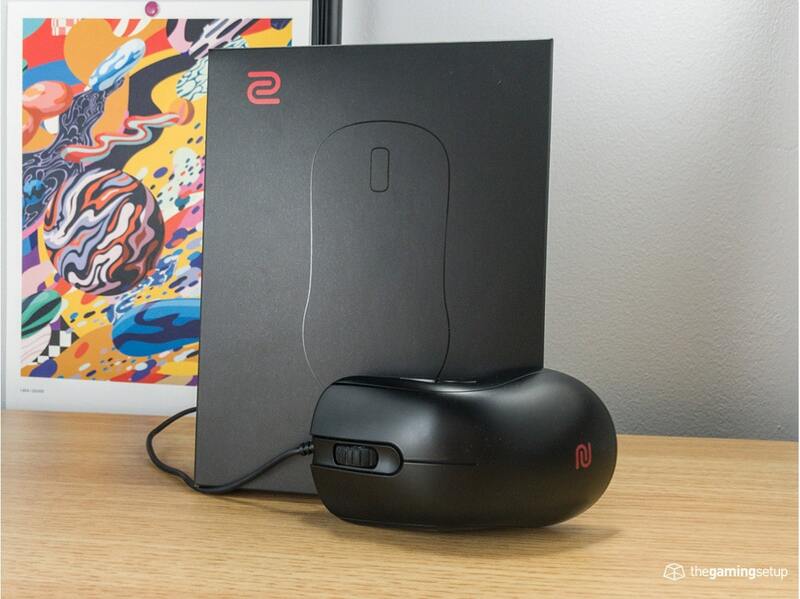 The Zowie FK series earns an honourable mention in our best mouse picks. The Zowie FK series has a unique ambidextrous shape that has many fans, if you are looking for a mouse that’s a little lower to the surface this might be your mouse. The Zowie FK series packs a classic mouse shape that suitable for essentially every grip, and due to Zowie having 3 different sizes, it’s also suitable for every hand size. 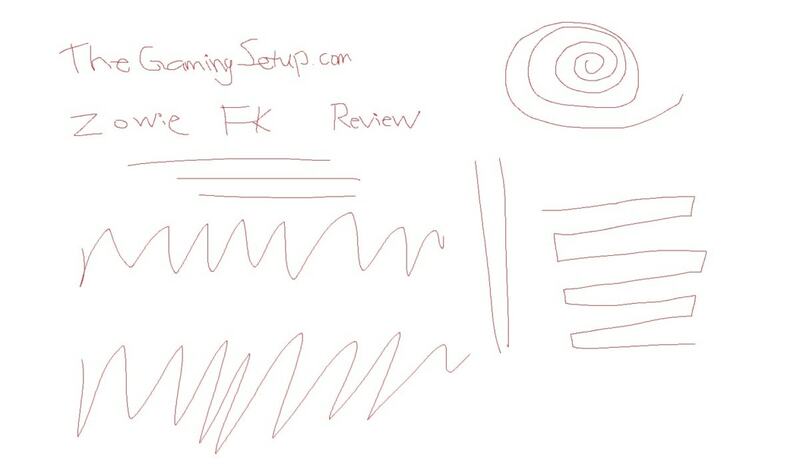 Its completely ambidextrous design makes the FK series one of the better mice for lefties. Coming from reviewing a lot of Logitech mice, the FK mice are significantly shorter in height, so if you like a high hump then you might need to move up a size on this mouse. 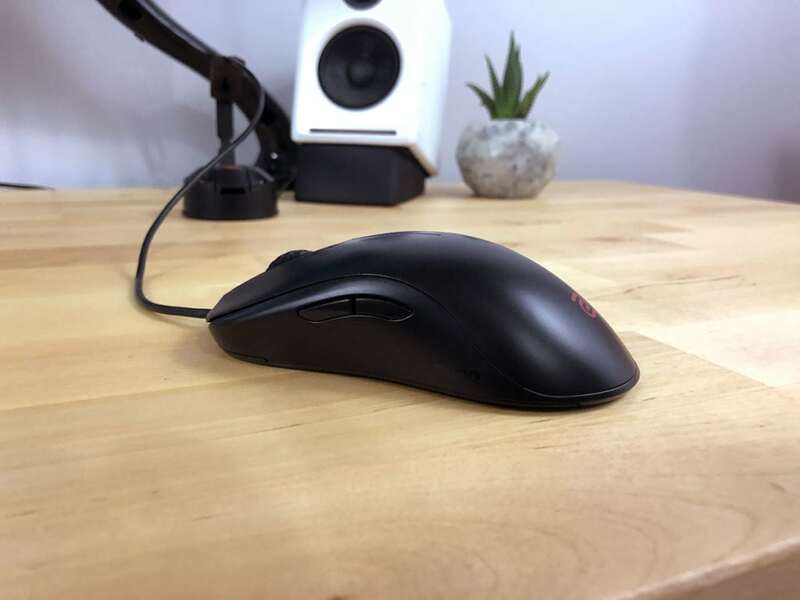 The sides of the mouse are made of the same material as the rest of the mouse, no special materials here, they’re curved slightly on both sides, the result is a very comfortable grip. A lot of people love this shape and for good reason, it’s definitely the most comfortable ambidextrous mouse shape on the market for me, it’s a shame Zowie hasn’t updated the sensor for this mouse yet. Zowie has done a great job at providing an option for every hand size and grip. The FK series feels really great in hand and has curves in all the right places for shooters in particular. No special materials here, the entire FK is made of a smooth black plastic with no obvious weak spots or sharp edges. I don’t miss any grippy material here, picking up the FK2 is a breeze due to its weight and great shape. There are no rattles or shakes when picking up and shaking the mouse. The FK mice feature two very large feet surface that glide well across all surface types, the glide on these feet are fantastic, smooth even on a control pad like the Zowie GS-R. All in all, a completely solid mouse with no real issues on the body. The Zowie FK series packs the AVAGO ADNS 3310 sensor, while still an admirable performer, this sensor has been out performed in 2018 by the more modern Pixart PMW 3360 sensor. To be clear, the 3310 is a good sensor, it tracks well at reasonable DPI ranges, it has low acceleration and prediction, but it’s not as raw in input as the 3360, it has a little more smoothing and has a little bit more lag. In-game, the difference is minimal, though I did feel it a little bit compared to the Logitech G Pro which packs a Pixart PMW 3366. The shape makes up for the sensor a lot, it’s just a mouse that aims well for a large majority of people and I still aim really well with this mouse in Overwatch despite a slightly worse sensor. With a low weight and super flexible rubber cord, the mouse controls like a dream, it’s a mouse that immediately felt native to my hand and I got up and gaming very quickly because of it. The mouse comes with no software and has preset DPI settings at 400, 800, 1600 and 3200, don’t use the 3200 setting. Lift off distance is very low allowing for rapid pick up and adjustment. The Zowie FK1/FK2 feature Huano switches for its buttons instead of the more common Omron switches. 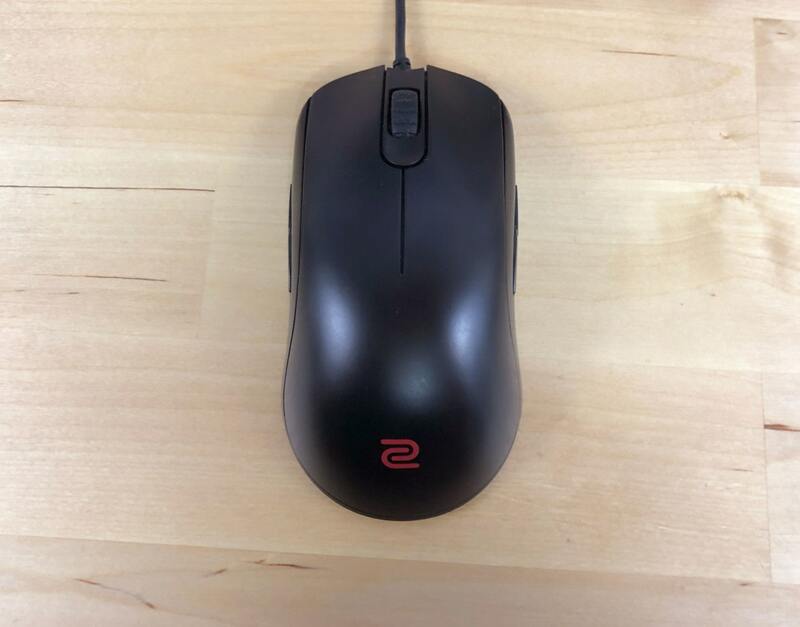 The Zowie mouse in comparison to other mice have a much stiffer and tactile click, this can be good for shooters where you don’t want any accidental clicks but could be bad for MOBA/RTS players where click spamming can get fatiguing. Some people really just don’t like Huano’s. The clicks on the FK2 are consistent between the left mouse button and right mouse button, consistently delivering a satisfying click. There are rumours that Huano switches are cheaper than Omron switches and have a more limited click life. From what I’ve seen after dozens of hours gaming with the Zowie, no issues to report, though some people have reported malfunctioning buttons it doesn’t seem wide spread, every mouse is bound to have a few customers with issues. The scroll wheel steps are VERY distinct and loud, Zowie seems to be aiming for high tactility everywhere, I don’t personally prefer the amount of noise that this scroll wheel achieves, the Rival 310 or Razer DeathAdder provide a tactile feel without making it sound like you’re ripping a Beyblade. The middle click on the Zowie is solid, it does feel a little stiffer than say the DeathAdder, its a solid middle click, no complaints. The Zowie FK mouse features side buttons on both sides of the mouse to allow for no fuss lefty or right use. The side buttons do not get in the way or interfere in any way with normal use, you can turn off a side of buttons via firmware so even accidental presses don’t activate anything. What’s missing that’s found in a lot of baseline button packages is the button on top to allow for on the fly DPI adjustments, this button is found on the bottom of the mouse of the Zowie. Zowie mice don’t require any software for full functionality, instead they opt for mouse combinations to set up settings. described below while plugging the mouse into the USB port of your computer. • Button 2 + 3: Left-side buttons are activated. Suitable for right hand use. • Button 1 + 3: Right-side buttons are activated. Suitable for left hand use. Press the DPI switch button (labeled ) to switch to a desired DPI setting. into the USB port of your computer. Outside of these settings, there’s nothing else here, no RGB, no profiles and its kind of refreshing to have a mouse just be purely plug and play. Here’s a quick reference to compare the FK series mice to other commonly compared mice. See our comprehensive comparison section. 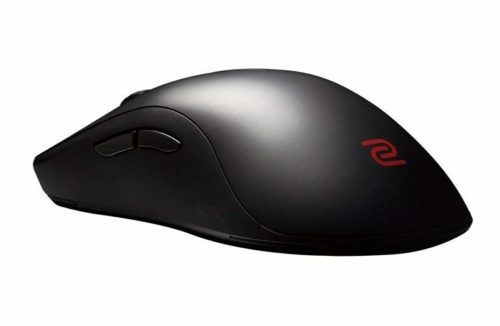 The EC1 and EC2 is Zowie’s ergonomic shape, I personally prefer the FK’s ambidextrous design, but the EC shape should feel more comfortable for right gamers. Outside of the shape, the only major difference is RGB, the EC2 series has a light up wheel while the FK doesn’t have any RGB at all. If you have a larger hand or like to palm grip I’d say try out the EC series. The ZA is a much taller mouse that’s suited for palm grippers that like taller mice to fill in their palm. What you prefer here almost solely depends on how you grip your mouse and the size of your hands. If you ‘re finding you’re cramping up on smaller mice then you should take a look at a ZA. Pre-release the Logitech G Pro Wireless was nicknamed the Logitech FK due to their similarity in shape. The G Pro Wireless does share a lot of the same shape designs as the FK2, but it’s a little taller of a mouse without the same level of slope towards the front of the mouse. These two mice basically serve the same hand sizes and grips so choosing or the other will come down to personal preference. Factoring out shape, the G Pro Wireless is the better choice if you have the budget with amazing wireless, better sensor and swappable side buttons. I see some people looking for this comparison and I’m not really sure why, these two mice are in very different categories. The Razer DeathAdder serves the large right handed ergo market, and the FK series serves an ambidextrous grip in the medium to small range. 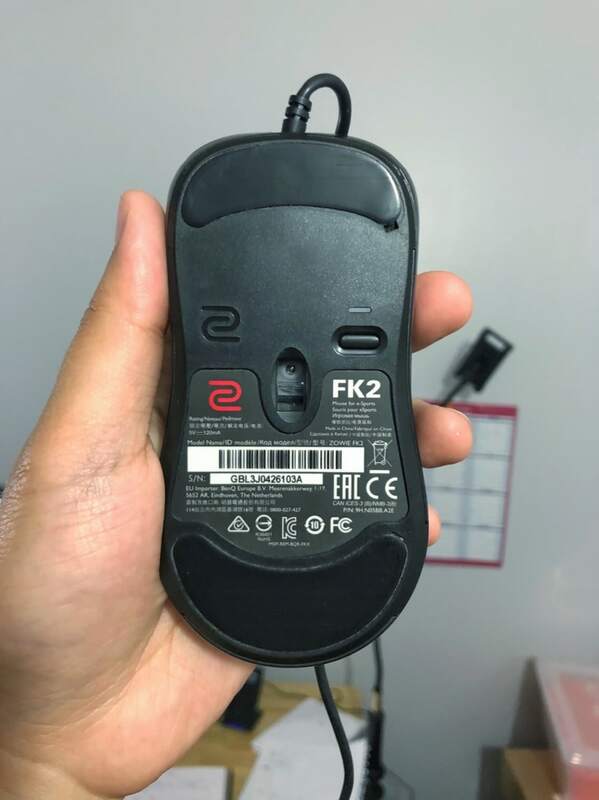 The Zowie FK series is relevant only because of its shape, the buttons are stiff and loud and the sensor is not a top tier sensor anymore, but you can’t really get the feel of the FK on any other mouse. Even in its current form the Zowie FK1 and FK2 are solid options given how wonderful it is to use with its great shape and high tactility. You should consider the Logitech G Pro/G305 or the Logitech G Pro wireless over this mouse if you’re looking for an ambidextrous mouse, they pack a better sensor, they have great wireless and they have some niceties that the FK series doesn’t have. On the flip side, those mice just aren’t as comfortable as the FK series for a lot of people. The sensor will do the trick as long as you don’t mind the occasional spin out, but its not a huge issue.